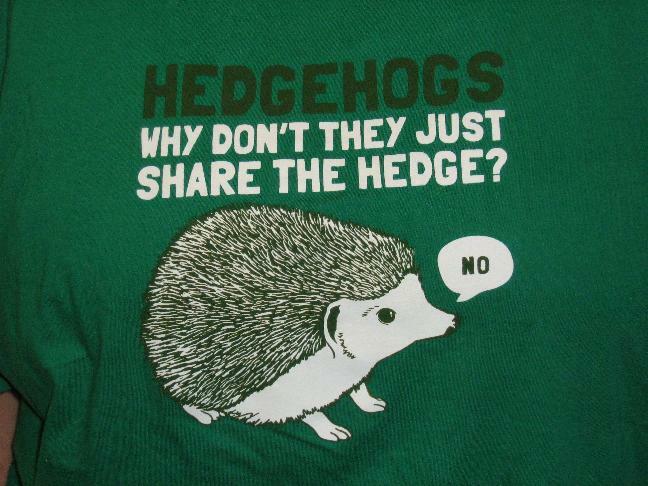 How much hedge would a hedgehog hog, if a hedgehog could hog hedge? Long time, no blog! Work, class, two ridiculously convergent time-sensitive deadlines…aargh! 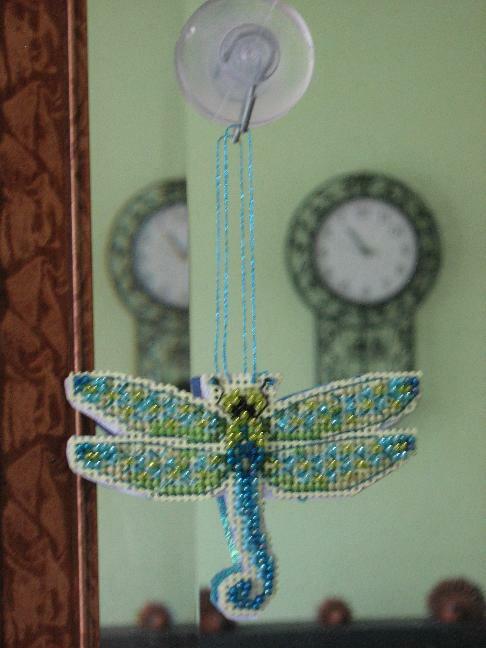 But: I completed my first non-cupcake project in ages and ages, and had to share. 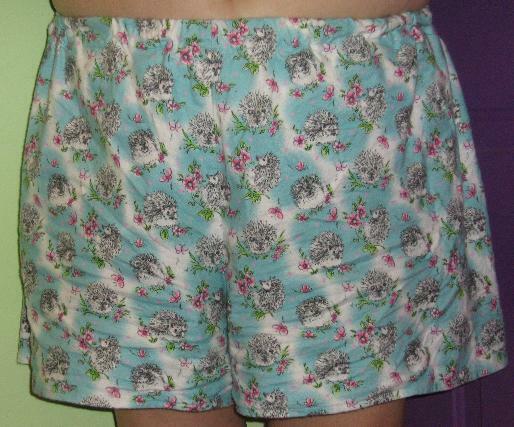 For Mother’s Day, I made Mumsie a pair of hedgehog-printed boxer shorts. I’ll try to be more faithful about updates. But with Father’s Day/anniversaries/birthdays around the corner, there’s got to be something craftacular to do, right? My mumsie’s birthday was also last week; naturally, much home-made goodness was in the works. 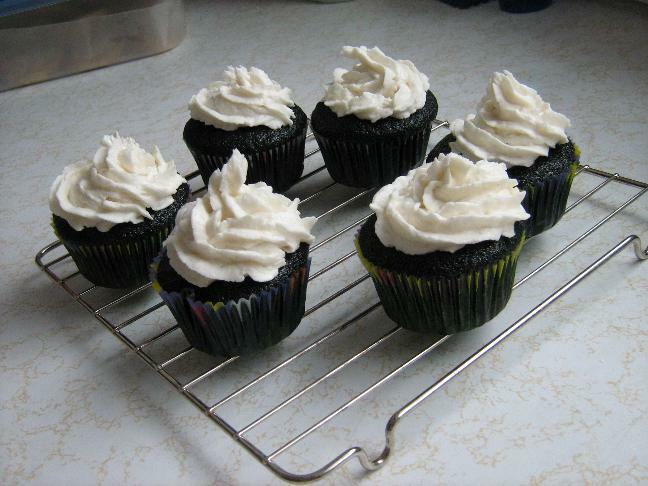 I made her blue velvet cupcakes (blue is her favourite colour) with vanilla-coconut buttercream frosting. It’s kind of hard to tell in the photo what colour they are, but trust me, they’re blue. It’s from issue 216 (I think!) 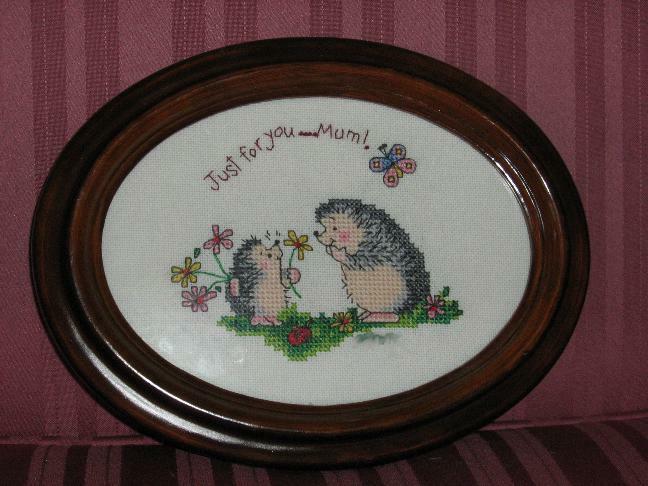 of Cross Stitcher, and originally said “Nice Cross Stitch”, but I took some artistic liberties with it. I still have a baby-sized callous on my finger from doing the backstitch on that. Uurgh. Trying to pierce the fabric where there’s no hole and it plainly doesn’t want to be pierced becomes old after a while. Still, I think the end justified the means. For the next piece, you must understand that “Bork” is a verb in our household, and not just an interjection. 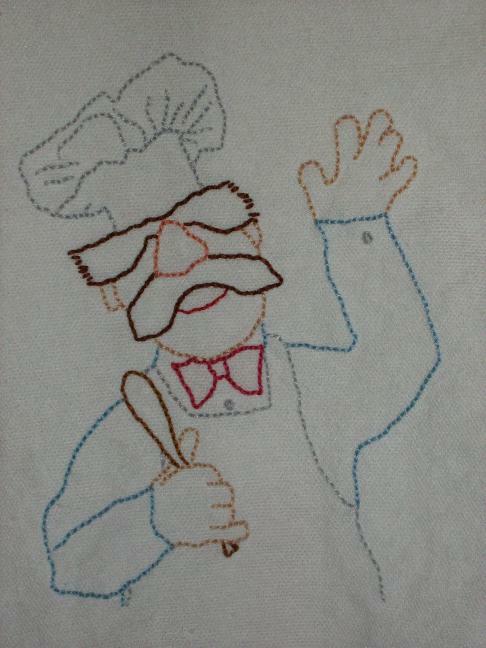 In the kitchen, dropping, spilling, or mixing vigorously and flinging, well, anything, will cause someone to yell, “You borked the ice cream/potatoes/toast!” (Much as the Swedish Chef yells “Bork, bork, bork!” just before he sends his utensils flying.) She “got it” as soon as she opened it, and I daresay as custom designs/projects go, this was one of the best. Also simplest. It’s on one of those awesome tea towels from Sublime Stitching which was an absolute dream to work on, and is currently brightening up the oven door. So…immediately after the Christmas rush and all the presents therein were finished, and I had had a chance to repress spending time with relatives and all that good stuff, I started a new project which, though some sort of time-machine trickery, I managed to finish for my mom’s birthday at the end of January. 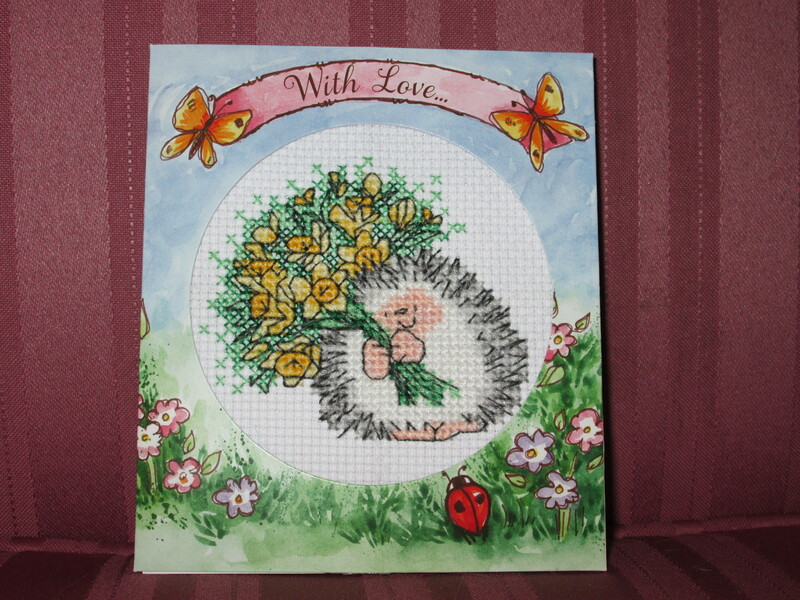 You’ll recall from my last post that she’s got a thing for hedgehogs, so I found this sweet Country Companions kit sent to me by my friend Rachael. It’s called “Birthday Surprise”, and at approximately 5″ x 7″ (this from the package details), is just a row or two too large for the 5″ x 7″ frame bought to accommodate it, but I can live with a little missing balloon. Ain’t he adorable? 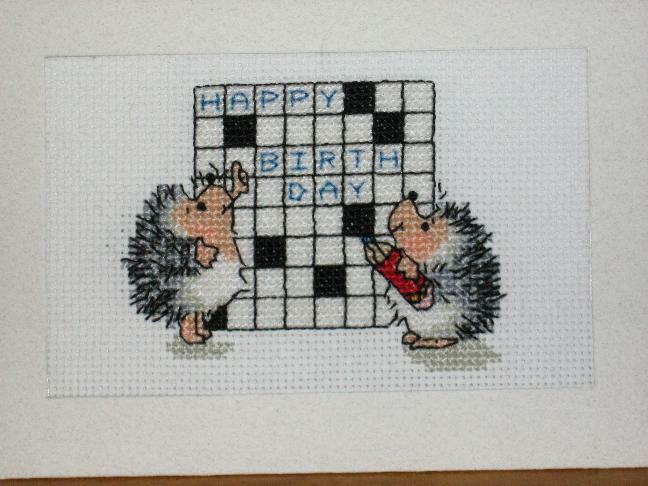 There are few things more becoming on hedgehogs than bashfulness.